Something more recent followers of this blog or my social media may not know about me is I used to be a huge So You Think You Can Dance fan. In its initial seasons (specifically, seasons 1-4 from about 2005 to 2009), I basically lived and breathed all things SYTYCD. Connecting to the dancers on the show was actually the reason I started using Twitter back in 2006! I was such a fan of this show, and its incredibly talented dancers, that back then, I even took trips to L.A. and Portland for the live tours, and I started and managed what ended up being very popular fan sites for two of my favourite SYTYCD dancers — Travis Wall (S2) and Mark Kanemura (S4). (Sadly, the fan sites no longer exist). This Wayback Machine screenshot from my old Travis Wall fan site gets me super nostalgic! Dancers like Travis, Mark, and the rest of SYTYCD’s talented contestants, led me to love watching dance performances. I even took a few dance classes as a result! Despite seeing a lot of the SYTYCD dancers on stage over the years, something I never got to do was watch Travis perform live. When the Alberta Ballet recently reached out to see if I wanted to attend one of their shows and share about my experience on social media, I was already looking forward to the partnership, but then when I learned that one of the performances the Alberta Ballet was presenting this season was none other than Travis Freaking Wall’s Shaping Sound, I was THRILLED!!! Travis Wall’s Shaping Sound runs Jan. 16/17 in Edmonton and 19/20 in Calgary. Learn more on Alberta Ballet’s website. Alberta Ballet presents Travis Wall’s Shaping Sound in Edmonton Jan. 16/17 and in Calgary Jan. 19/20. I seriously can’t tell you how excited I am to see Travis Wall’s Shaping Sound. I’m also excited Alberta Ballet is giving me a pair of tickets to give away!! Leave a comment on this post, telling me what your favourite dance genres are! Also, did you ever watch So You Think You Can Dance?! Also, have you ever seen an Alberta Ballet performance? (This is a mandatory entry. You must leave a blog post comment in order to qualify for a chance to win). Head to my Facebook Page and tag a friend to spread the word about the Alberta Ballet! I’ll pick a winner after Thursday, Jan. 11! Disclaimer: I will always provide my 100% honest opinion on this blog. The Alberta Ballet gave me complimentary tickets to a show of my choice, and a pair of tickets to giveaway. This does not impact the opinions stated in this post. If you couldn’t tell by this post, I am super, super, excited to see Travis Wall’s Shaping Sound show! I’ve never seen any live ballet performance, most of the live dance I’ve seen has been contemporary and break dancing. I loved SYTYCD the early seasons as well. It was a program I watched with the roommate. We would place bets and loser had to by brunch that weekend. :) Can’t say I have a favourite genre to watch. My favourite dance genres are contemporary and ballroom. I grew up watching the first few seasons of SYTYCD and as A result I would always dance in my bedroom although I had no idea what I was really doing. I have never been to an Alberta ballet performance before but I would love to see one and I am a fan of Travis wall as well. I love hip hop and contemporary dance. I’ve never seen SYTYCD or an Alberta Ballet performance but love dance and would love to watch live. I love contemporary! It’s such a unique way to express yourself through dance. I’m a dancer myself, and my favourites atyles are pointe and cecchetti. Something about the difficult nature of these dances is amazing not only to watch, but to perform. Since I’m a dancer myself, I’ve never actually watched an Alberta ballet!! We would love to see shaping sound! I love watching SYTYCD! Always so impressed with contemporary and the Latin styles. So much talent! I’ve never seen a performance by the Alberta Ballet but would absolutely love to. I love all kinds of dance; I’ve been dancing since I was a little toddler; I danced to compete, to teach, to relieve stress, to exercise and now I’m in my 50’s and I still 💃🏻 dance: folk, jazz, cha cha, hip hop,etc; I had the pleasure of experiencing Alberta Ballet’s The Nutcracker almost a decade ago and would be thrilled if I get to watch them again with Jim Wall’s group! I like contemporary dance. I used to love watching SYTYCD. I’ve never seen an Alberta Ballet performance, unless you count Shaping Sound when it was here a few years ago. I used to watch SYTYCD all the time in its early seasons and Travis Wall was my absolute favourite dancer at that time. I was always totally in awe of his creativity and choreography. I’ve never seen a ballet performance in real life before, but I’ve always wanted to. My favourite genre of dance is hip hop and vogueing, and I was very excIted when two world collided and Travis Wall was a guest choreographer on RuPaul’s Drag Race. I have seen the Alberta Ballet perform way, way, way back when I was a teenager. I have watched So You think can dance. I would have to say ballet is probably my favourite dance to watch. Never seen AB ballet, but would love to! I have not had much opportunity to see any live dance. But have always wanted to. I watched a couple season of SYTYCD when it first came out. My favourite to watch on TV would be hip hop. But have always dreamed about seeing the ballet. Well I’d have to say Lyrical is my favortie….a little biast as I love love love watching our daughters tell stories via dance. Definatly have caught a few seasons of SYTYCD too of course ;) And we have frequented many an Alberta Ballet productions over the years….Balletlujah was amazing story telling with KD Lang’s music. We were at the show when she was there and it was so great to see her and be watching and listening….a huge treat. I love hip hop , but after all the years of religiously watching SYTYCD, i believe now contemporary is amazing to watch!!! Would love to take my daughter to see Travis wall live! It would be her first time at an AB ballet show as well as mine! My favourite style would be contemporary. I love So You Think You Can Dance and Travis Wall. I don’t think I saw Alberta ballet. I did go to Shaping Sound a few years ago. It was AMAZING and would love to go again. Favorite I would say is Hip Hop, I have seen SYTYCD but nor yet the Alberta Ballet. Would love to go with my wife. I have never seen a performance presented by the by the Alberta Ballet, but I love watching modern/contemporary, ballet, and ballroom. I did years of ballet as a kid and had a brief ballroom stint too! My favourite styles (to dance and watch) are hip hop and contemporary! And fun fact, I was actually in the AB Ballet’s production of the Nutcracker back in 2007 as wee child! I’ve seen the Nutracker, and I like contemporary! I enjoy many genres of dancing, and I think contemporary is my favorite. I was very into SYTYCD for those same seasons! 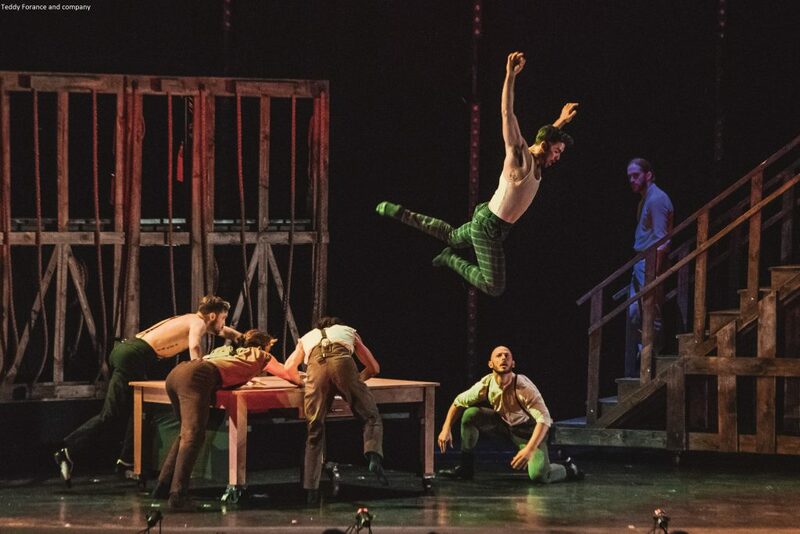 Travis Wall, Twitch, Allison – so many talented dancers, and I would love to see this production in person even though it’s a different format. I like comtemporary, hip hop and I do Chinese dance. I haven’t watched Alberta ballet but I’ve seen SYTYCD. Thanks for the giveaway I would love to go! Favourite dance genres: love contemporary and a lot of the classics! Did you ever watch So You Think You Can Dance? You bet! Love the talent! Have you ever seen an Alberta Ballet performance? Yes! Love seeing them preform! 90’s hip hop all the way and love modern contemporary dance mixed in with today’s music. Never been to ballet and would live to take my son. Definitely loved SYTYCD but sadly no time lately. I adore classical ballet – by far my favourite style of dance. That said, I love how classical ballet now seems to draw inspiration from a variety of dance styles. Alberta Ballet’s collaborations to the music of Sarah McLaugchlan, Elton John and Joni Mitchell (all of which I have seen) are great examples of that. I have been to many performances of Alberta Ballet in about the last 5 years and I love it each and every time. Contemporary, modern, ballet, .. love it all! Love YTYCD Jeff M season 3 season hooked me! , maybe the Nutcracker many years ago. My first love in life was (and still is!) ballet. I am a huge fan of sytycd (Preferred the old panel of judges, not all these celebrity judges who have no dance background) and yes, I have been to many Alberta Ballet performances. I loved Travis Wall on sytycd and his choreography since, would absolutely die to go to this show. My daughter and I went to see the Alberta Ballet for the first time in December. Both of us loved it. I have always watched SYTYCD and now it’s a family affair. Travis Wall’s choreography is always one of my favourites. My daughter and I would love to see his production. My favourite genres are ballet and contemporary. My daughter’s – contemporary and hip hop as it is so different from her own genre (Irish Dance). I love contemporary dance and Wall’s SYTYCD sunflower dance still makes me cry! I try to see as much Alberta Ballet as possible! Love hip hop and modern styles. Watched that show here and there in passing but not too often! Oh, and I’ve not seen live balet before! I absolutely love SYTYCD, and would absolutely love to get to see Travis. His pieces are so incredibly moving, and it would be amazing to be able to take a friend of mine, whom I had regular dates with to watch the last season. My favourite Alberta Ballet experience was seeing Joni Mitchell’s The Fiddle and the Drum and would love the chance to see another performance! I had season passes to Albert Ballet as part of a New Years resolution a few years back and loved their performance of a Midsummer Nights Dream. Fave genre? I’m not sure I can pick one! SYTYCD is brilliant for breaking down the stereotypes of what dance can be, love the pairing of classical dance with modern music! I was obsessed with SYTCD for years and watched with my little sister. Mark was definitely my favourite dancer and I still follow him on social media. I think my favourite dance genre is lyrical or ballet. I saw Alberta Ballet for the first time this past December when I took my daughter to see the Nutcracker. It was fabulous! I’d love a chance to see this show and it would be an awesome birthday present (my birthday is on the 15th). Just like you I’m a huge fan of SYTYCD and continue to watch it because I love to see Travis’s choreography. My favourite genres of dance are contemporary, hip hop, and tap. I have never attended any of the Alberta Ballet live shows and would love to win!!! My favourite is contemporary or jazz. Was a huge SYTYCD fan too especially the first few seasons- loved when dancers crossover into other dance genres and do really Well! Ive only seen the nutcracker with Alberta ballet so would like to see more if i can! I love watching contemporary dance! I also used to do hip hop (I wasn’t very good haha) but I love watching the professionals do it. Used to watch SYTYCD waaaay back in the first season. Have never been to the Alberta Ballet but it sounds like it would be a ton of fun!